Conservation Innovation Agricultural Field Day to Feature Drones! On August 31st local farmers and conservation partners are invited to participate in agricultural field day on Michigan State University’s Campus. The Conservation Innovation Field day is a partnership between local Conservation Districts, Farm Bureau Chapters, USDA Natural Resources Conservation Service and MSU Extension. It will highlight the use of innovative farming practices and technologies to improve conservation of natural resources on Michigan Farms. Bruno Basso, associate professor at MSU, will be joining the agricultural field day to demonstrate his work using Unmanned Aerial Vehicles (UAVs) to model water and nutrient cycling in relation to agro-ecosystems. Basso is working to develop SALUS, a next-generation process-based model that integrates crop productivity with water, carbon, and nutrient fluxes in a spatially explicit manner. MSU Extension will be discussing applications and limitations of UAVs in agriculture. The day’s agenda will also include information about biofuel research utilizing sorghum, pest management updates, leveraging existing services available through event hosts, tours of the newly MAEAP Verified MSU Horticulture Farm and an overview of the MIFFS Veterans in Ag Network. The field day, will take place on Monday, August 31, 2015 at the MSU Horticulture Teaching and Research Center, 3291 N College Rd on MSU’s Campus. RUP credits will be available for certified pesticide applicators who attend and MAEAP phase 1 credit is available for all participants. UPDATE** Registration is FREE as Ingham and Eaton County Farm Bureaus are sponsoring the event. Those interested in participating in the tour should contact the Eaton Conservation District (517) 543-1512 ext. 112 no later than August 25th to register. Space is limited. Do you care about your local rivers? Join us for a night of food and fun on the Michigan Princess Riverboat. Partners include: Eaton, Ingham, and Clinton Conservation Districts, Tri-County Regional Planning Commission, MSU Institute of Water Research, Mid-Michigan Environmental Action Council, and more! This is an update from the Michigan Department of Natural Resources about private forest land issues. We hope that this information will help you manage, protect and enjoy your forest. The Commercial Forest Program and the Qualified Forest Program provide lower property taxes for private forest landowners who actively manage their forest. Both programs require that landowners obtain a forest management plan and follow its recommendations in exchange for the reduced property taxes. The voluntary Forest Stewardship Program helps landowners develop a Forest Stewardship Plan that meets the requirements of both tax programs, and landowners must comply with their Forest Stewardship Plan when enrolled in either property tax program. The Commercial Forest Program provides property tax breaks for landowners who are managing at least 40 acres for commercial timber production. Land enrolled in the program does not have an assessed value, and landowners pay a specific tax rate, currently set at $1.25 per acre. The Commercial Forest Program requires public access by foot onto your land for hunting, fishing and trapping. The application deadline is April 1 for tax benefits in the following year. The Commercial Forest Program is administered by the Department of Natural Resources. Application forms and more information are available on the Commercial Forest Program website. The Qualified Forest Program provides property tax breaks for landowners who are actively managing forests between 20 and 640 acres. The Qualified Forest Program does not require public access onto your land. Landowners can avoid up to 18 mills of local millage taxes, although there is a 2 mill equivalent annual fee to administer the program. Sept. 1 is the application deadline for tax benefits in the following year. The Qualified Forest Program is administered by the Department of Agriculture and Rural Development. Application forms and more information are available on the Qualified Forest Program website. Rick and Kim Heuvelman, along with Rick’s brother Randy, own a 160-acre forest in Newaygo County. They bought 80 acres 11 years ago and added another 80 acres three years ago. While they have been actively managing land on their own, they decided some professional help was in order. Click here to read more about the Heuvelmans’ experience with the Forest Stewardship and Qualified Forest programs. Did you know that 2.2 million acres of private forest land are enrolled in the Commercial Forest Program and another 300,000 acres are enrolled in the Qualified Forest Program? The private and public forests in Michigan support rural economies, allow access for recreation and hunting, produce clean air and water, and provide many other economic and ecosystem services. To learn more about the programs available to assist private forest landowners, or to find the DNR service forester in your area, go to www.michigan.gov/privateforestland. Grab your gear and head off into the trees to see if you can find the biggest trees in Michigan! Or try entering a tree you see in a park, along a sidewalk, even your backyard. Big trees are everywhere! Entry deadline is August 1, 2015. ReLeaf Michigan created the Michigan Big Tree Hunt contest in 1993. Before the contest, Paul Thompson, a brilliant botanist, searched for Michigan’s big trees and kept records since the early forties. Today, we encourage Big Tree Hunting among all age groups to assist tree experts with tracking these vital historical living landmarks. We will forward the winning entries to the State Coordinator of the Michigan Big Tree Program, who will review them for possible inclusion in the State Champion Tree List. These champions with review of additional critieria are considered for the National Register of Big Trees issued every two years by American Forests. This year, Michigan has 19 registered National Champions. We're looking for the biggest trees in each county so send in your entries even if you see a bigger tree of that species on the state's list. After all, trees die and are cut down so we need to track as many big trees as we can. Flex your Michigan pride by helping us highlight our beautiful trees! Anyone can! The Michigan Big Tree Hunt is a great activity for families, groups of friends, fun dates, or solo adventurers. 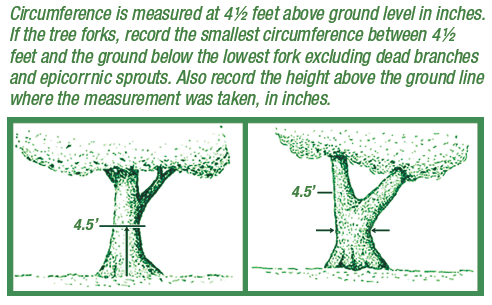 By identifying big trees you can take part in a statewide effort to track these living landmarks. You could find the largest tree in your county or even the state! The biggest trees are nominated for the State Champion Tree List and possibly entered into the official National Register of Big Trees. Contest Details Win prizes! ReLeaf Michigan's Big Tree Hunt committee will review all submissions. Winners will be announced at a special ceremony this autumn where certificates and prizes are awarded. All entries must be postmarked by August 1, 2015. Visit http://releafmichigan.blogspot.com/ to download the entry form. The Middle Grand River Watershed Plan has been approved by the Michigan Department of Environmental Quality and the Environmental Protection Agency. Please click here to view the plan - broken down by chapter. Unfortunately, due to website space limitations, we are unable to include the full appendix online. Please contact our office for more information. Stream Table Education a big Success! Science Adventure Camp is an opportunity for 4th and 5th graders to do hands-on experiments and get excited about science. This year Eaton Conservation District staff borrowed a large Stream Table from the Ingham County Drain Office to educate the students about Rivers. The stream table was a great addition to the program, the kids were able to learn, make predictions, and adapt their river design. Each of our 8 education sessions lasted 40 minutes. We started by talking about soil types, erosion, and deposition and students felt loam, clay and sandy soil samples. We ran three cycles of the stream table – one with directions to work as a team and create a river, the second round we talked about where erosion had occurred and how to prevent it, and the third round we tried to slow down the river as much as we could (meanderings, dams, structures). This was especially timely because it took place a few days following the large rainfall storm on June 22nd. We talked about culverts, flow capacity, and roads washing out.